DAVID LE/Staff photo. 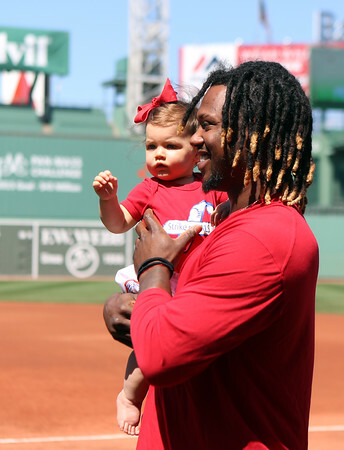 Boston Red Sox left fielder Hanley Ramirez picks up Lucy Frates, the daughter of Beverly native Pete Frates, and carries her towards other Sox players as the Red Sox joined Pete Frates and Pat Quinn to kick off the Ice Bucket Challenge for August 2015 at Fenway Park on Friday afternoon. 7/31/15.